Katrina Gillum won this year’s Shropshire Ladies’ County Golf Championships in a tight knockout match against Lucy Evans at Shrewsbury Golf Club. Seeded number one, Katrina qualified for the knockout stages of the competition with a 151 gross over the two rounds of medal play during which she broke Shrewsbury Golf Club’s Ladies course record with a round of 71 including 7 birdies. Lucy Evans, seeded 7th, qualified with a gross of 177 and played great golf in three knockout rounds to meet Katrina in the final. Lucy Evans wins the Helen Corser College Cup and Katrina Gillum lifts the Lady Forester Cup as winner of the Championship. On Thursday 28th May the cream of Shropshire County’s Golfing Ladies came to Shrewsbury Golf Club to compete in the Shropshire Ladies’ County Golf Championships. Eighteen players from ten golf clubs across the county entered the scratch match competition. The first two rounds are medal play with the best 16 gross scores qualifying for the knock out stages of the competition held across the next two days. Katrina Gillum, number one seed, got off to a good start with a round of 71, taking Shrewsbury Ladies’ golf course record with seven birdies on the card. Drawn against Mair Robinson, seeded 16th, from The Shropshire Golf Club, she went on to beat Tania Pearce, seeded 9th from Oswestry Golf Course and Victoria Raffle, seeded 4th, in the semi-final. Lucy Evans, seeded 7th was drawn against Ros Curel, seeded 10th, from Wrekin Golf Club and then beat Isabel Green, Seeded 15th, from Church Stretton Golf Club. She then took on Gemma Thornell, seeded 6th, from Oswestry, emerging victorious from a tight semi-final round that went to the 21st hole. The exciting final between Katrina Gillum and Lucy Evans saw a tightly contested final between two of the county’s best players, both from Lilleshall Hall Golf Club. Katrina and Lucy both have aspirations to be golf professionals, playing on the European Tour. Nineteen year old Katrina, currently off 1 handicap, is working with John Bandurak, PGA Head Professional at Lilleshall Hall Golf Club, to develop her skills before looking to qualify as a tour professional in the next few years. Twenty year old Lucy Evans, playing off 3 currently, is honing her golfing skills with regular coaching from Tim Shrosbree and Andy Dunbar. 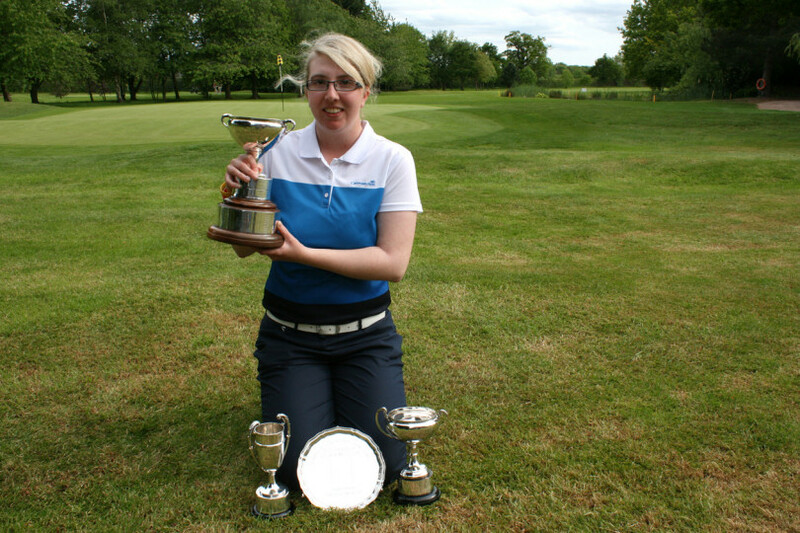 Serious illness meant Lucy took a year out of golf and her performance in the championships sees a return to form to clinch the Helen Corser Challenge Cup. “I’ve achieved much more than I expected in this competition, so I am really pleased with my performance over the last three days. I would like to thank my family and friends for the tremendous support they have given me over the last year and I am looking forward to a good season of golf this year. Katrina played great golf this week and I’d like to congratulate her on winning,” said Lucy. Katrina’s solid performance throughout the competition saw her presented with a range of trophies including the Jean Barrowclough Cup, for the leader of the first round, aged under 30 years, the Nina Howells Salver, for the leader over the first two qualifying rounds and the Lady Forester Cup for winning the championship. The final saw Katrina take an early lead, before Lucy brought the match to all square at the end of the first nine. However, Katrina emerged victorious, on the 17th to become this year’s champion. “I’m delighted to have won the championship and played some good early rounds that put me in a strong position. I’d like to thank my playing partners throughout the week and Lucy for a tough final, she played well. I’d also like to thank Ashley, my brother for his skill as my caddy and Shrewsbury Golf Club for the fantastic course conditions that made the championship challenging,” said Katrina. Katrina has aspirations to qualify for the Ladies European Tour in a few years’ time and is preparing herself for her next tournament the English Women’s Amateur Championship. “I’m continuing to work hard with my coach to ensure I can play consistently well over four days of golf to be able to compete on the Ladies European Tour. I feel I shall be ready to look at turning professional and qualifying for the tour in two years’ time,” reveals Katrina.